3 Reasons Why Hunters Need an Intimidator | Intimidator Inc. Hunting is like a lot of other sports and recreational activities in the sense that hunters have never-ending piles of equipment, tools, ammo, and guns. Granted not all equipment and weapons are used at one time; it’s a lot for one person to carry. 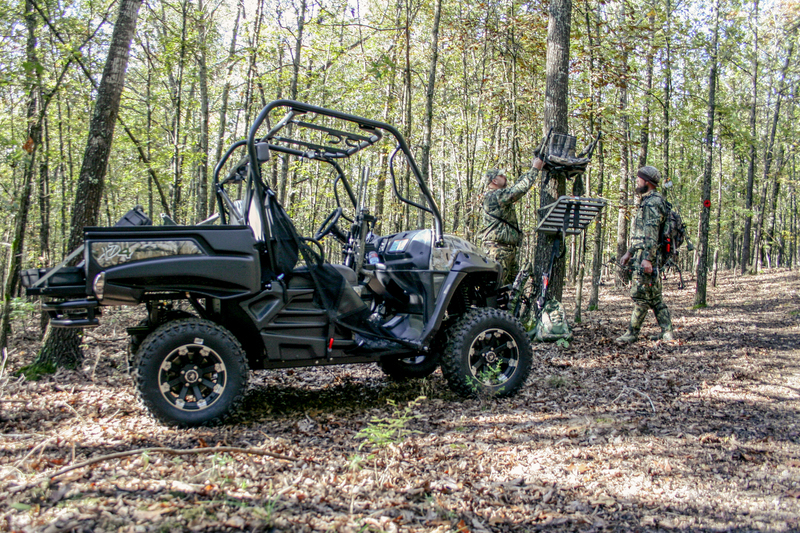 Check out how Intimidator UTVs can give hunters a helping hand. We’ve all been there. You’ve done a little research and scouted the perfect location to place your new tree stand. But wait…how are you going to get the stand to your new location? You could try to carry it through the dense trails or maneuver it onto your four-wheeler. However, we believe in working smarter, not harder, so hauling it through the rugged terrain on an Intimidator UTV is the way to go. With features like 2,100 lbs. towing capacity and a 6-foot bed that can easily transform into a flatbed, the Intimidator Truck series is the perfect option for towing heaving equipment or odd shaped items. Let’s say you decide to go out for a hunt all by yourself early one morning. BOOM! There it is! The 10-pointer you’ve been hunting all season. The only problem now is how to get it back home. We all have our tricks of the trade, but if you had an Intimidator UTV, getting this prize kill back home would be a breeze. Our Intimidator Classic Series has a Versa-bed perfect for hauling any game, feed, equipment, tools, coolers, and so much more. If you want even more room in the back, our Intimidator Truck Series comes stocked with a full bed with drop down sides to create a convenient flat bed. Sometimes you just need a little time with your crew. However, getting everyone to the hunting grounds can be tricky…not to mention uncomfortable on a quad or four-wheeler. The Intimidator Crew Cab Series comfortably seats six adults in premium bench seats and has a full size bed in the back to hold all of your hunting gear. The great thing about Intimidator UTVs is that they were made for the hunt. With power and performance, these American-made beasts were meant to take on the toughest terrain, haul the heaviest of loads, and still stir up a little dust for a little joy ride. Whether you choose the Classic, Crew, Enforcer, or Truck Series, the Intimidator UTV packs unparalleled power, strength, and performance to help you get the job done and accelerate your adventure. Want to experience the difference of an Intimidator UTV? Check out our DEALER LOCATOR to find a dealer near you.